This healthy Zucchini Noodles with Shrimp recipe is ideal for anyone following a keto, low-carb or gluten-free diet. This easy zoodles recipe is bursting with amazing buttery lemon garlic flavor and is perfect for meal prep. Ready from start to finish in just 15 minutes! This easy-to-make recipe features a winning combination of butter, garlic and shrimp tossed with zucchini noodles. If you are not familiar with zucchini noodles, aka “zoodles”, they are basically noodles that are made from cutting zucchini into long, thin strands. Zucchini noodles are a great gluten-free alternative to regular pasta and are also a bit lighter to eat. Tip: It’s a good idea to stock up on frozen shrimp when it is on sale (that’s what I always do). It thaws very quickly and is a fantastic go-to to have in your freezer when you want a fast and easy meal, like this one! Spiralizer – This is the spiralizer I own and love! It is generally known as the top industry spiralizer. It is so easy to use and creates perfect zoodles every time! Julienne & Vegetable Peeler – If you don’t want to buy a spiralizer, you can use the Julienne side of the peeler to slice the zucchinis into long, thin ribbons. An advantage of using this tool is that it is less expensive and easier to store than a spiralizer. 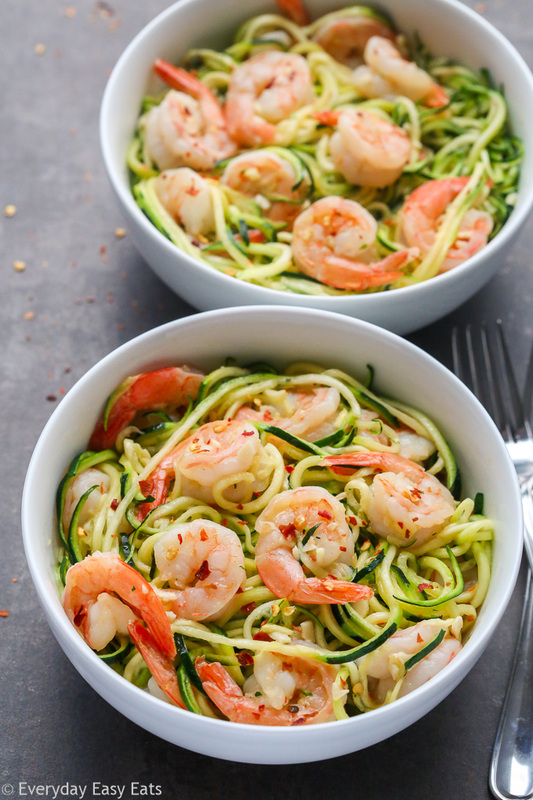 This healthy Zucchini Noodles with Shrimp recipe is keto, low-carb and gluten-free! Bursting with buttery lemon garlic flavor and perfect for meal prep. Spiralize the zucchini using a spiralizer and set aside. Alternatively, you can use a julienne peeler to cut the zucchini into noodles. Heat olive oil and butter in a large nonstick frying pan over medium heat. Add garlic and chili flakes. Cook for 1 minute until fragrant. Add shrimp and a pinch of salt. Cook for 2-3 minutes until shrimp is pink and opaque. Turn off heat. Stir in the lemon juice. Add zucchini noodles and toss to combine. Be careful not to overcook your zoodles, because they can get a bit mushy. Remember to turn off the heat before adding the zoodles to the pan and then just toss with tongs to combine. This is the perfect weeknight dinner for a family, Alia! I love using Spiralized veggies. Sometimes i mix them with regular pasta, although it is more work than just using one or the other. But this dish sounds so yummy with just the zucchini! It looks so spring-y, too! This is such a delightful recipe! Simple and so yummy! Zoodles are always light on the tummy and much better than pasta! Hey Alia….! I love shrimp and this looks mouth wateringly, and I love your pictures as well. I can’t wait making this shrimp noodles. Thanks for sharing….keep shared your new recipes with beautiful idea…..! Hi Samantha! Aww thanks so much! ♥ You’re welcome! Oh Alia…this looks so delicious. I love zucchini noodles and adding shrimp must make it taste sooooo good. This I have got to try.